ECO/CLEAN DESIGN: Made of high quality wood, these decorative toppers are laser cut to perfection and smooth finishes! GIFT IDEAS: Perfect gift to any new homeowner or person moving/relocating! 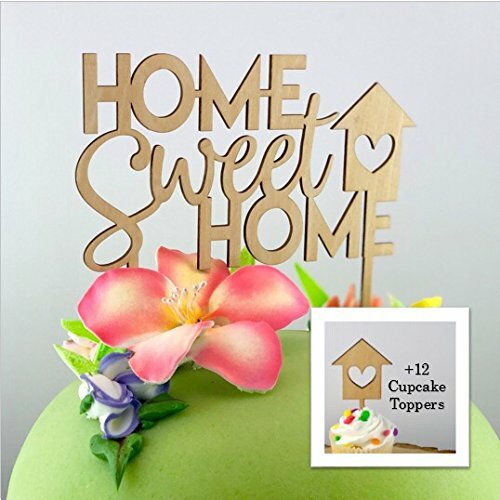 Throw a housewarming party and add a touch of charm to the celebration decor! DECOR IDEAS: Not a cake eater? Stick the toppers into a plant (or mini plants) and gift to your client, loved one, friend, etc.! GREAT for Open House table decorations too! Get creative! Paint them, bling them, gift them, ENJOY THEM! Reusuable, durable and so so charming! If you have any questions about this product by Cheers to Charm, contact us by completing and submitting the form below. If you are looking for a specif part number, please include it with your message.